In Europe, there are two groups of crows who are almost identical — except for for thing. Carrion crows are all black, while hooded crows have patches of gray. Each group prefers to mate with their own color. It sounds like what humans would call racism, but instead it's a lesson in the limits of anthropomorphism. Two studies published this week in Science represent exhaustive analysis of the two crow groups, from their behavior to their genomes. What the researchers found was that the two groups occupied very-rigidly divided territories, with a thin "hybrid" zone running between them that was no more than 150 km wide at any point. In the map below, you can see the crow territories. Carrion crows are in the dark region in western Europe, and hooded crows are in the lighter central and eastern European areas. The dark line is the hybrid zone, where the two groups meet and often interbreed, producing fertile offspring. Still, the birds overwhelmingly prefer to mate with other birds of the same color. This reinforces the color differences between the two groups. Does that mean the two groups are becoming separate species? It seems very unlikely. After exhaustive analysis, the two groups of researchers concluded that the crows were pretty much genetically identical. There were only three differences between them: color, the colors they preferred when it came to mating choices, and dominance behavior (carrion crows have slightly higher levels of hormones that govern aggression). Of the 82 DNA base pairs that differed between the two birds, reported evolutionary biologist Jochen Wolf and his team, "81 of them were concentrated in one genomic region coding for genes involved in coloration and visual perception." What this means is that the birds didn't just differ in color — they differed in their abilities to perceive color. The more they choose birds of the same color, the more they evolved to perceive those color differences. And this brings me back to my earlier assertion, which is that this is one of those scenarios in animal behavior where it's extremely tempting to impose a human perspective and say that these crows are racists. They prefer to mate with their own color. The crows even have an actual color line running through their European habitat, dividing black from piebald. But the fact is that these crows' mating choices have nothing to do with a slave economy, historical inequalities between groups, or cultural conflicts — all hallmarks of human racism. There is undeniably a certain mystery behind why the birds evolved to be so acutely sensitive to color in mating choice. But they are hardly the first birds to fetishize feather colors for seemingly no reason other than sexual desire, as the peacock's insane tail attests. The researchers suggest the two groups may have been separated by environmental conditions at some point in their evolution, and only reencountered each other relatively recently in species time. And their future is uncertain too. 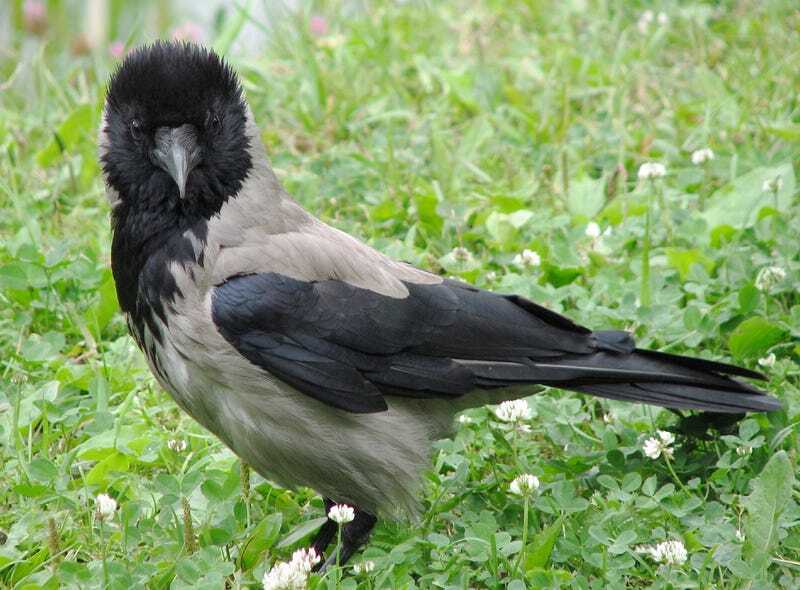 One group of researchers believe that the carrion will eventually overwhelm the hooded crows, while another believes the opposite. But for now, these crows are testimony to the way small genetic differences can lead to scenarios that seem — from a human perspective — far more meaningful than they actually are.